180 gram neon yellow vinyl including download code. Before releasing a string of albums on the El Paraiso label and hitting upon their trademark sound of soft, warm and even jazz-tinged psychedelic rock, Papir released their first and perhaps most experimental record to the world in a limited pressing of only 250 copies. Even in their early days, the Copenhagen trio Christoffer Brøchmann Christensen, Nicklas Sørensen and Christian Becher Clausen were virtuosos in their art of hypnotizing rock, and their debut record is a testament to the group’s early devotion to krautrock. Incorporating haunting, industrial sounds, keyboards and otherworldly guitar sounds into their tapestry of sound, Papir gives a glimpse into the band’s early days where a certain weird joy in experimentation was palatable. Hints of the blissful psychedelia the band is now known for shine through in intervals, only to collide against beeps and loops, submerging and emerging while unexpected sounds assail the listener. 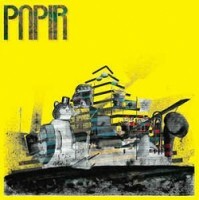 Papir is a beautiful and highly unique record in the band’s catalog that will be appreciated by the band’s current fans as well as krautrock enthusiasts. Papir’s first studio album is a powerful statement that established the band immediately as one of the most creative psychedelic forces in the European scene. Stickman Records is reissuing the record for the first time on vinyl since 2010. 2. LYKK TREP-R HI LOS?